The living room is one of the most important spaces in your home; it’s where you relax, catch up with family and friends and make a lot of memories in. With that in mind, the décor of your living room can make or break the space. It’s crucial that you decorate your living room perfectly to your tastes, in order for it to really feel like home! If you are hoping to upgrade your living space or just add a few touches to the existing room, it can be tricky to know where to start. The smallest change can make the biggest difference, so do your homework! To help you get started, here are some great tips to help you update your living room. This sounds both silly and time consuming, but stay with us. Your furniture has probably stayed in the same place for a long time, while you decorate around it. What if you moved your sofa, or put the TV in a different corner? It could completely transform the way the room looks, and how you use it. Looking for ways to move the room around might help you to discover a better way to use the available space. You might find that rearranging your furniture creates even more space for you to take advantage of. There is nothing more uninspiring than blank walls in your living room. Adding artwork to the walls can make it feel cosier, and allows your personality to shine through a little bit more. Choosing artwork for your living room gives it character, but what if you don’t really know much about art? Look for abstract or geometric pieces that add shape and colour to the room, or make it much more personal to you and your family. You can use family photos throughout the house to make it feel much more welcoming. 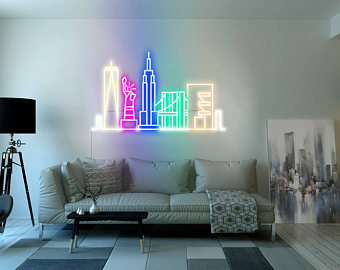 A popular idea in place of artwork is neon signs for your home. A neon sign creates a focal point for the room, and can consist of almost any design you want. You can have a neon sign made just for you, with your family name, quote or symbol. Perfect for bringing your living room into the modern age, it’s becoming a popular way to decorate your home. Painting is probably the easiest way to upgrade any room in your home. It’s important that you find a colour scheme you love, and stick to it. Use different shades of the same colour in accents around the room, such as cushions, lampshades or rugs. Not only will this create a relaxing feel to the room, it will demonstrate just how much thought has been put into the décor. Colours such as grey, blue, green and neutrals are often used in living rooms to create a balanced, peaceful environment for you and your family to relax in. Adding plants to your living room will have a bigger impact than you think, especially in regards to colour and smell. Whether you invest in a leafy green indoor plant to sit on the bookshelf, or a huge bunch of multicoloured flowers for the coffee table, it adds a beautiful, decorative touch to the room. Bringing the outdoors inside has been a popular trend with interior design and Best Indoor Electric Space Heaters For Large Rooms for some time. Touches of nature in your living room is calming and actually quite good for you too; some plants have air purifying abilities.